Welcome to our website! 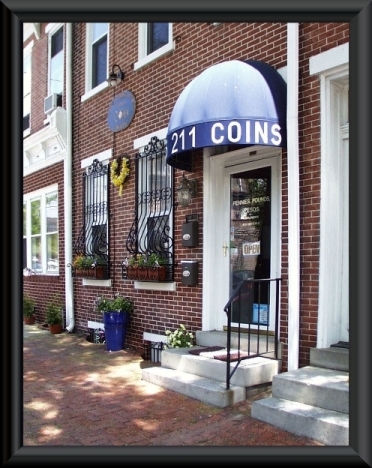 Media, Pennsylvania, knows the Pennies, Pounds & Pesos Coin Shoppe is the place for U.S. and World Coins. We now offer the same superior service and selection to the rest of the country via our website. Our expert staff, unmatched selection and reasonable prices have helped Pennies, Pounds & Pesos earn our reputation for convenience, quality and value. Established in 2006, Pennies, Pounds & Pesos provides the knowledge and experience to help you select the best coins for your collection. This site was last updated: August 21, 2017. Like most websites, some pages are always being updated, so check back often. Thanks for visiting. This site is best viewed in full screen mode. We have Barber dimes, Barber quarters, Barber half dollars, Buffalo nickels, Certified coins, Commemorative coins, Dansco coin albums, Franklin halves, Gold bullion, Gold eagles, Half cents, Indian Head pennies, Large cents, Lincoln cents, Mercury dimes, Mint sets, Morgan dollars, Peace dollars, Proof sets, Seated Liberty dimes, Seated Liberty quarters, Seated Liberty half dollars, Standing Liberty quarters, Silver bullion, Silver eagles, State Quarters, Walking Liberty half dollars and World coins and much more in stock.